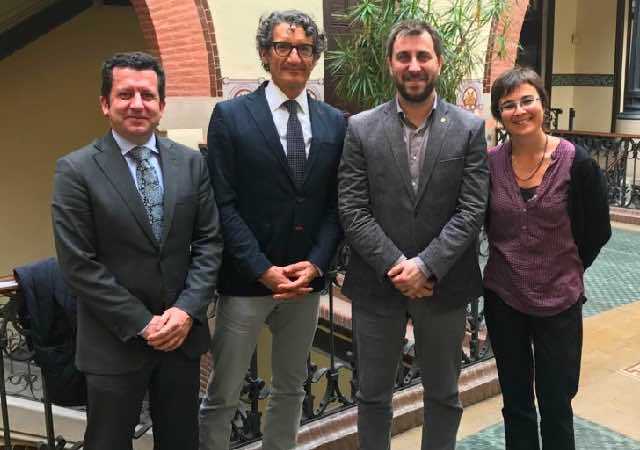 The Barcelona Macula Foundation has set out its basic aims and the status of its principal research projects in a meeting with Antoni Comín, the Health Minister of the Government of Catalonia. The delegation from the BMF: Research for Vision, comprised Dr. Jordi Monés, its Medical Director, Joan Parra, a member of its Board of Trustees, and Anna Borrell, its Assistant Director. They described the Foundation’s mission and vision, which is underscored by the vocation to conduct research in order to eliminate the forms of blindness that are today incurable. Mr Comín showed his interest in the European projects in which the BMF takes part. These include EYE-RISK, a proposal funded by the European Union’s Horizon 2020 Programme that seeks to define individualised risk profiles in terms of the different subgroups of AMD. The delegation also informed Mr Comín of the conclusions drawn from other projects of continental scope that have now been completed. One of these was PRO4VIP, a collaboration with the Agency for Health Quality and Assessment of Catalonia (AQuAS) among others. This project concerned Innovative public procurement and aimed to respond to the unmet needs of those with low vision. Dr. Monés also briefly explained the results of the LITE project, which was conducted with the Institute of Photonic Sciences (ICFO) among others and supported by the Catalan Agency for Business Competitiveness (ACCIÓ). This has given rise to the construction of a high-performance optical apparatus that is capable of capturing images of the retina at cellular level. He also addressed the ADVANCE(CAT) initiative, which is led by Biocat and enjoyed the support of ACCIÓ within the framework of RIS3CAT, an accelerator for the development of advanced therapies.